Regional Development Minister Igor Slyunyaev participates in the II National Forum of Development Institutions which opened on April 2 in Yekaterinburg. Head of Regional Development Ministry spoke at the plenary session of the Forum “Inter-layer cooperation between development institutions: how to create synergy?”. The plenary session was also attended by the Governor of the Sverdlovsk Region Yevgeny Kuyvashev, Representative of the President of the Russian Federation for the Protection of the rights of entrepreneurs Boris Titov, President of the Russian Union of Industrialists and Entrepreneurs Alexander Shokhin, Chief Executive Director of the National Investment Agency “Invest in Russia” Yury Voicehovsky, the EBRD, the World Bank, the Eurasian Development Bank, the “Skolkovo” Fund. Moderator of the meeting was the Partner of the Audit Department of “Deloitte ” CIS, Sergei Nekludov. Yekaterinburg Forum gathered more than thousand participants from 60 regions of the country. Among those discussed there were questions of the organization of effective interaction between development institutions, roll-over of successful international and regional practices, improvement of cooperation between business and development institutions. Opening the plenary session the head of the Ministry of Regional Development Igor Slyunyaev noted that the Forum “definitely found its unique place among variety of modern forums and investment platforms”. Among the topics under discussion, he drew attention to the problem of establishing a national investment rating of Russia. According to the Minister, very often international investment ratings are subjective in nature and therefore, as shown by the crisis in 2008, are at the “trash” level. In this regard, according to Igor Slyunyayev, it is important that national rating system was improved and gained international recognition. – It is important to connect the international development institutions so that they work together to form the national ranking system. For example, the organization of WAIPA – World Association of Investment Promotion Agencies, – suggested the Regional Development Minister. The Head of the Regional Development Ministry believes that cooperation with WAIPA may restore confidence in the international rankings, shattered during the 2008 crisis. Igor Slyunyaev recalled that 20 years ago five European countries accounted for more than 95 % of global investment, today 50% of world investment go to developing countries , the other half of the world’s investments are directed to “new markets”. About a third of global investments are investments in real estate sector. “In a globalized world, competition for investment is also global in nature,” – he said. According to the Minister, Russia needs long-term direct and portfolio investment, and at the first stage – mainly cross-border foreign investment. The most important ingredients for success, according to the Minister, are the investment climate, provision of better environment for business investment and better standards, and the country’s overall image in the perception of foreign investors. – Mechanisms for attracting investment are being constantly improved and we need to create clear mechanisms for investors and create conditions for the implementation of investment standards in the Russian regions. The conditions for attracting investment should be provided at all levels – national, regional and private, – said Igor Slyunyaev. Minister noted that particular attention should be paid to the role of local governments, which “must become active participants in the process of attracting investment because there are real projects being realized at the municipal level”. 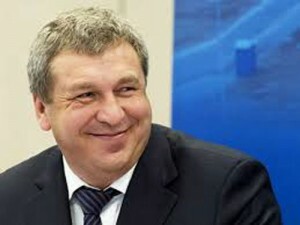 According to Igor Slyunyayev relations between regions, national companies and foreign investors should be based on long-term basis, and the work of investment agencies and development institutions need to be coordinated, so that foreign investors do not get confused in the existing diversity of institutions in Russia. Now, he said, foreign investors have little access to information about the state of the real sector of the Russian economy. Meanwhile, such information is very important for decision- making, and the overall image of the Russian regions is no less important. – Among many factors a vital role is played by so-called “soft factor” – the system of relations between all participants in the investment process. For every investor it is important to create individual system of relations based on mutual understanding during the implementation of investment projects. Strategy development should be the main tool for managing the result, – said the Head of the Regional Development Ministry. He wished new contacts, contracts and ideas to all gathered in Yekaterinburg, and that the Forum had become a traditional and really useful platform for all participants in the investment process. “The road is overcome by walking “, – concluded Igor Slyunyaev. The guests of the International Exhibition Center “Ekaterinburg- Expo” were addressed by Sverdlovsk Governor Yevgeny Kuyvashev. Regional and federal authorities, as he said, should be aimed at further improving the investment climate, and not only through a set of benefits, but also with the use of PPPs. According to the Governor, a special role is played by the formation of strong communications, provision of feedback to the business, increase in its overall awareness. “The main thing is to hear each other better being on the same page and solving the tasks that we set for ourselves,”- he said. The moderator of a panel discussion, Sergey Nekludov, noted that now, according to various estimates, Russia has about 70 regional corporations and agencies, and the task is to identify successful examples of activities of development institutions and to replicate them. During the plenary session the results of a study “Development Corporation of the Middle Urals” were presented. Thus, as a result of the analysis the main priorities for the development of regional agencies were identified: FDI, inter-layer cooperation, the creation of infrastructure for business, industrial and business parks. It was highlighted that the idea to create a community development institutions was put into practice. As was noted, in order to improve their performance further it is necessary to stimulate communication between regional and federal development institutions as well as to unify approaches. Responding to a question on what steps are needed to optimize the inter-layer interaction, the head of the Regional Development Ministry Igor Slyunyaev shared the experience of the Working Group on increasing the investment attractiveness of Russian regions at the Ministry of Regional Development, which conducts the selection and systematization of regional investment projects. According to the Minister, in 2013 there were about 1,500 projects sent from the subjects of the Russian Federation to the Working Group for consideration. The quality of most of them was found to be deficient. “Only 38 projects can be actually called investment projects”, – said the Minister. Igor Slyunyaev stressed the importance of the development of investment strategies of subjects of the Russian Federation, which must be followed by concrete action plans, as well as the need to improve the quality of the business environment and the quality of management. Head of the Regional Development Ministry also stressed that the business must be patriotic, so it is important to complete the process of bringing the Russian business back to Russia from offshore. The Minister recalled the motto of Russian merchants, who had been the slogan of the newspaper “Stock Exchange News”: “Profit is above all, but honor is above profit”. – Development institutions should not replace development itself. Now there is a struggle for authority, but development institutions should not only compete, but complement each other. This requires clear, uniform rules and individual approaches for each region. To define such approaches is the task for both society and the state in general, – said Igor Slyunyaev. The plenary session of the Forum was also attended by the CEO of the National Investment Agency Yury Voicehovsky, the agency created at the auspices of the Ministry of Regional Development. He described the world trends in competition for investment and stressed that in Russia over the past seven years there have been significant changes improving the investment climate, a number of successful investment projects have been implemented and extra-budgetary sources of funding have become increasingly important. – From dynamics and growth point of view the Russian market is leading one in the world. Lack of awareness of the Russian market is the information vacuum that must be filled out, – said Yury Voicehovsky. In his speech he highlighted the problems that today we all need to pay attention to: the lack of up- to-date strategies to attract investment and coordination between the regions, lack of strategies for development of sectors of the economy, as well as the difficulties with the formation of priorities, etc. – Main tasks for a newly created National Investment Agency are promotion of regional agencies, promotion of regional investment projects, the establishment of the system of communication between regions. We need to share success stories. The success story of one region will help to attract investment to other regions. Now the package of regional investment projects is being formed. There is investment interest on behalf of China, Singapore, Sweden, Turkey, France, – said Yury Voicehovsky. The plenary agreed that development institutions should become the infrastructure basis for the implementation of long-term economic policy in Russia, for ensuring the modernization of the national economy as a whole and for giving a powerful impetus to the development of the Russian economy.